Former UFC bantamweight champion Ronda Rousey (pictured) has decided to trade in the world of real fighting for fake fighting. At the conclusion of Sunday night’s Royal Rumble, Rousey’s trademark “Bad Reputation” (OK, Joan Jett’s trademark) hit the speakers, and she made the walk down the WWE aisle for the first time as a professional wrestler. Rousey wore a classic “Rowdy” Roddy Piper-inspired t-shirt, but with “Ronda” written across the chest, underneath a black leather jacket once owned by the WWE legend. Piper’s son gave Rousey the jacket prior to tonight’s festivities. Piper was Rousey’s favorite pro wrestler, hence “Rowdy” Ronda Rousey. Many thought Rousey would make her WWE debut tonight as a surprise contestant in the Royal Rumble in Philadelphia, but she did her best to throw fans off by issuing several tweets the past few days of her in Columbia filming “Mile 22” after being radio silent on Twitter all month. WrestleMania 34 takes place April 8 inside Mercedes-Benz Superdome in New Orleans, so that’s when Rousey will officially break in her full-time WWE contract. 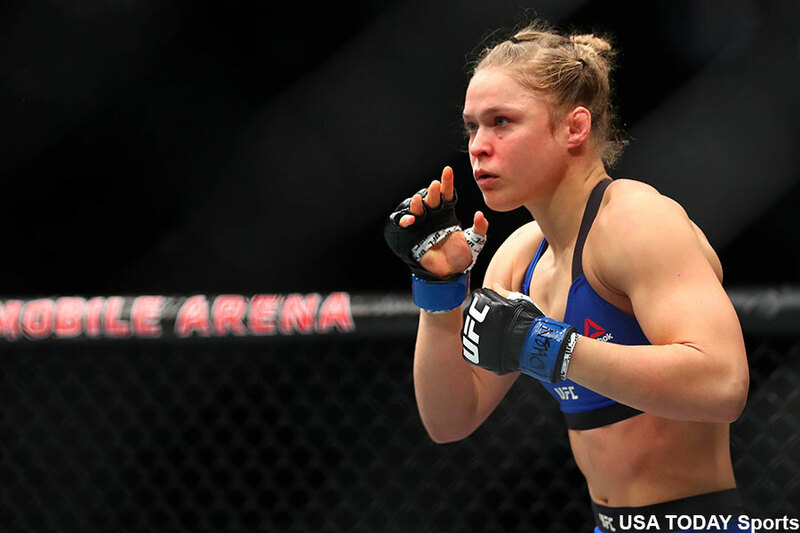 Which leads us to UFC fans’ next question – does this mean Rousey is officially done with MMA? Well, Rousey wasn’t quite ready to close the cage door for good. Rousey might be done with MMA, at least for now, but it’s clear she has still not gotten over her last two devastating and landslide losses. When asked if she’s come to terms with getting knocked out cold by Holly Holm to lose her UFC bantamweight title, then getting pummeled by Amanda Nunes for a chance to reclaim her crown, Rousey refused to provide an answer. “I think I’d just rather not talk about that right now,” the 30-year-old said after turning away for several uncomfortable seconds. Rousey, arguably the most mainstream superstar to emerge from the UFC, leaves MMA with a 12-2 record. Whenever she’s ready to accept the UFC back into her life, Rousey will be inducted into the UFC Hall of Fame.